Our Alexander bed raiser range listed below is capable of raising the majority of beds available on the market today, ranging from single to kind sized. 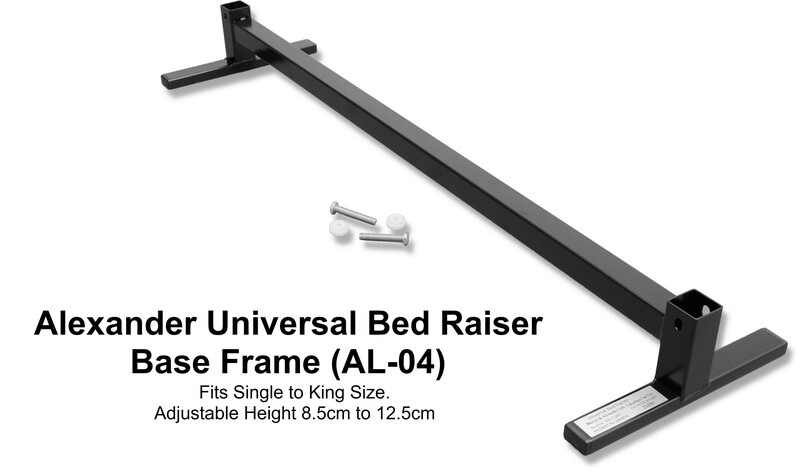 Please select from below the raiser (or raisers) that best suits your bed. The Alexander Universal Bed Raiser is designed to safely and discreetly raise.. The Alexander® Furniture Disc Raiser ​is ideal for corner units and comprises of a thin trip.. The Alexander Universal Twin Cup Attachment is used in conjunction with the Alexander U.. The Alexander Square Cup Attachment is used in-conjunction with any of our Alexander Un.. The Alexander Square Cup Attachment is used in conjunction with any of our Alexander Chair/S.. The Alexander Flat Plate Attachment is used in conjunction with any of our Alexander Chair/S.. The Alexander Round Cup Attachment is used in conjunction with any of our Alexande.. The attachment is height adjustable – See the Specifications tab. The raised furniture d.. The Alexander 3 Sided Square Cup Attachment is used in conjunction with the Alexander Chair/.. The Alexander Large 3 Sided Square Cup Attachment is used in conjunction with the Alexa.. The Extender Bar is used in conjunction with Morris and Alexander Chair/Settee & Bed Rai.. The Alexander Universal Bed Raiser (Pair) is designed to safely and discreetly raise th..